Photo courtesy of Kate Austin: Bonne the blue heeler ran away from her owners seven years ago. The past several years she'd been living in Madrona Woods. She was recently trapped and is now getting used to domestic life. Kate Austin and Jeremy Jones were still dating seven years ago when Bonnie first ran away. It was Jones who had adopted the blue heeler, the dog having been raised on a farm. The 2-year-old was scared by the unfamiliar noises she heard in the Central District, Austin said. The couple called in Useless Bay Sanctuary founder Jim Branson to help them track down and trap Bonnie, who had been moving between the Washington Park Arboretum and Broadmoor. Jones bought wildlife cameras that they placed in the arboretum, which helped them know where to set up the traps. Another volunteer eventually nabbed the dog after it spent a month running loose. When the 2-year-old blue heeler broke free of her harness during another walk a month later, the couple didn’t see Bonnie again until the dog was finally caught this February. Her owners searched for more than a month, Austin said, and Jones only stopped checking Craigslist for mentions of Bonnie a couple years ago. Much of Bonnie’s seven years running loose in Seattle are a mystery, but the blue heeler haunted the Madrona Woods for the past several years. “We called it Daisy, because at some point on Nextdoor Madrona somebody thought she belonged to someone down there and her name was Daisy,” said Madrona resident Vicki Ruskin. People would report seeing the dog further away, Ruskin said, and complain about the barking. “Sometimes the barking would last 15-20 minutes at a time, and then it would resume a half an hour later,” said Richard Silverstein, who lives across from Ruskin on 38th Avenue East, just up the hill from the Madrona Woods. Silverstein said there had been multiple attempts over the last four years to capture Bonnie but with no success; she either avoided the traps or outsmarted them and made off with the food inside. Branson had been a volunteer with the Missing Pet Partnership when Bonnie first ran away. He started Useless Bay Sanctuary in 2013. The nonprofit helps find about 100 lost dogs a year. He’d heard several times about a dog running loose in a park in Madrona, and knew animal control had attempted to catch it a few years ago. Ruskin confirmed Bonnie avoided the trap animal control officers set up in the alley by her house. When Ruskin reached out to Branson about catching the dog, he’d just finished building a new, much larger trap he’d purchased. Branson didn’t know at the time it was Bonnie, the blue heeler that had once eluded him. Ruskin said Branson called her within 30 minutes of sending her first email. The two began coordinating Bonnie’s capture. Ruskin started feeding the blue heeler three weeks before then, calling to her Daisy. About 10 minutes later, the food would be gone, she said. This developed a pattern for Bonnie. Branson had wanted to attempt Bonnie’s capture sooner, but his access to the neighborhood was hampered by the February snowstorm. He got his opening on Feb. 13, and went about setting the trap near Ruskin’s trashcans. She then put the food inside. “I cooked up some pork to make it especially appealing,” Ruskin said. It wasn’t long after Branson had returned to his vehicle and started video recording the trap that Bonnie arrived and tripped it, the blue heeler spinning around, but not fast enough to avoid capture. Silverstein said he came over and loaned his smaller crate for Bonnie to use. “It was heartbreaking to me that this dog had missed seven years of being with an owner and being a pet,” he said. Bonnie is settling in with Austin and Jones, who now live in a house in White Center with a large, fenced yard. Bonnie had always been chipped, she said, but no one had ever come close enough to check. “Now she has a chip and we have a GPS tracking system on her,” Austin said. She and Jones can check Bonnie’s location on their phones. She’s still not a fan of noises, but their home is in a quieter neighborhood. Jones and Austin took the first week off to spend time with Bonnie, she said, and also hired an in-house trainer to help. 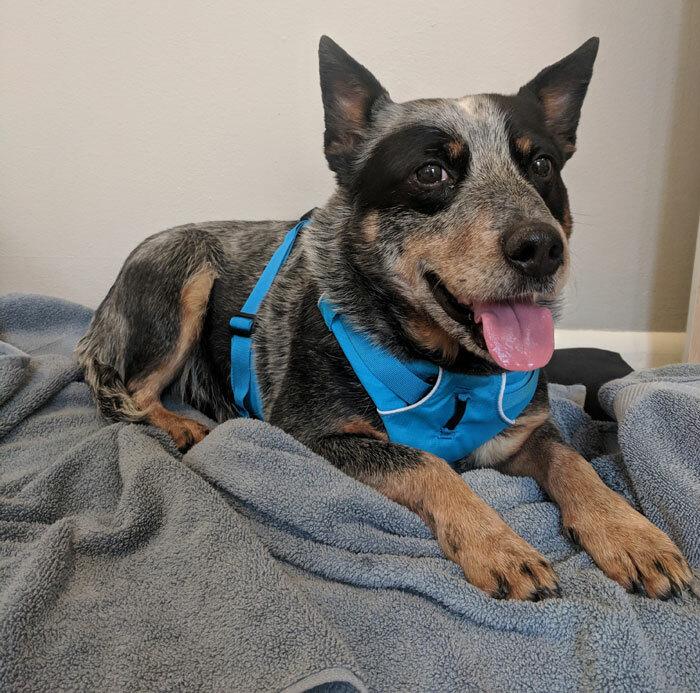 After seven years on the run, the now 9-year-old blue heeler received a clean bill of health from the vet, Austin said. “In fact, the vet was convinced that she couldn’t have been living on her own, someone must have been taking care of her,” she said. Silverstein has a theory that Bonnie might have spent some of her time with a person he’d seen living under the chassis of an old car near Spectrum Dance Theater, and then in a nest his own dog found surrounded by blackberry bramble in Madrona Woods. “It made it practically impenetrable if any coyote or animal wanted to get in there and get the dog,” he said, adding his dog also found some soup bones in there. Ruskin credits Nextdoor Madrona for helping her discover Useless Bay Sanctuary and finally closing the case of Bonnie’s disappearance. She and Austin now keep in touch, and Ruskin is looking forward to petting Bonnie for the first time.